What's this cartoon story about? Now this is just one of those news stories that makes one's head spin and it seems to me, that I might as well add my ignorance to the discussion with everyone else. The facts of the matter are quite simply all a situation of premeditated ignorance. One of my favourite events in a hockey game some years ago with Hockey Night in Canada broadcaster Bob Cole frustrated with a referee's call, pointed out that "if you aren't confused then you haven't been paying attention." Mr. Cole's statement truly applies to the Danish newspaper cartoon story. Now to set things straight, I am approaching this topic from total ignorance, I have never knowingly met a person who was a member of the Islamic faith. All I know about it is the work I did as a history teacher, sociologist and psychologist, which means that I simply have no first hand knowledge, only the summation of "book learning." Clearly, that is a limitation in most things and I have to take what I have read and studied and somehow make sense of this world that is presented in the news, and frankly this whole affair is one of total confusion. This situation stems from the publishing of a set of cartoons by the Danish newspaper Jyllands-Posten when a Danish author, Kare Bluitgen, could find no-one to illustrate a children's book about Islam. The paper wondered why this was a problem and twelve cartoonist contributed their light-hearted illustrations of the prophet who founded the religion during the eighth century. This was in September and the paper published some of these renderings which have not been published by Canadian news papers or electronic media. When I set to work to create a top of the page picture of this story I suddenly realised what the fuss is about. In the ten commandments, which are basic to the Jewish faith and Christianity, there is a serious warning about making idols of the one and only God. For the most part, these two religions have avoided idolatry. Images and various three dimensional depictions of the man who claimed to be the son of God, adorn most Christian churches, which is sort of bending that law a bit, well at least that is what I thought having been brought up a protestant and having some serious reservations about my Catholic friends and the decorations in their churches. 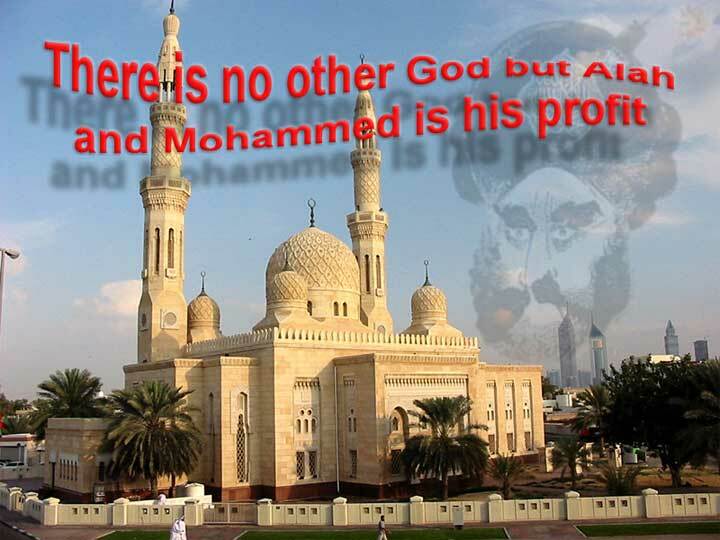 Islam is based on the Jewish faith and considers Jesus of Nazareth a profit of their religion that developed eight centuries after his death, but it took many things from these two earlier monotheistic religions. A ban of pictures, or depictions of the prophet Mohammad is one of their serious issues. As I mentioned when I considered the top of the page image, I realised that doing an illustration could place me in danger. I am not a fearful man and in our civilised society there are few real dangers, but characters who high jack loaded passenger airplanes and fly them into buildings declaring their belief in their god is something to think about. But, since I have never met a member of the Islamic faith I consider gun touting mounties a far more present danger as they drive around town with their bullet proof vests and loaded pistols every day. This isn't paranoia, its related to reality, the only person to be injured in Tisdale in the last decade from a gun shot was a policeman who was able to shoot himself in the foot at target practice. I'm not sure, but the way I heard it, he was the instructor. True or not doesn't matter, its a good story. The point being, that life is difficult enough without worrying about religious freedom. So please think this over, if it is blasphemy to publish depictions, funny or otherwise of Mohammad, how did this lead to people being killed in the streets in the Middle East, and Danish and other European products being boycotted by the frantic folks who pray facing East several times a day? Well that's what makes this an interesting story and calls to question the sincerity of all involved. A Danish Islamic scholar Ahmed Akkari put together copies of the cartoons and added several that were clearly hate mail and had never been published by anybody, and began a campaign to get the folks who speak Arabic worked up. Like you, the people out burning things and screaming hate slogans, have never seen the cartoons. The reality is, that the frantic fundamentalists of the Islamic faith are pain in the posterior to many Europeans and a harmless cartoon is one peaceful way of pointing out the ridiculous carrying-on of people who think its just fine to conduct a "holy war". The masses of the Middle East are less than happy with their lot. Almost up to their knees in $70 a barrel crude oil and almost none of that wealth getting to anyone, makes most of them resentful, oddly enough not at their leaders who pocket the wealth and fund wars against Americans, but against the people who are the consumers of the expensive oil. At this point I should remind you of Bob Cole's comment, "if you are not confused, you haven't been paying attention." Personally I believe the problem is one of education and freedom of expression. The attractive nature of Islam, as I understand it, is its simplicity, only a few simple rules to follow; pray a few times a day, give alms to the poor, once in your lifetime make a trip to Saudi Arabia and subject women to being property and lesser beings. Whenever people make things simple, they rely upon dogma and individual thought and awareness are suppressed. People are not simple, religion of any kind should not be simple and life is a complex thing. People who rely on the simple are indeed, simpletons! The Canadian media's decision to not publish the cartoons is not politeness to a minority group, it is fostering ignorance and there is nothing more dangerous than not knowing, or understanding things. I really should not mouth off about this issue without having some first hand acquaintance with a believer, but alas, that just isn't possible, so I have to stick to the fundamentals. Knowledge, will set you free and one other pretty important thing every kid learns in kindergarten, about name calling, sticks and stones and that kind of thing. The frightened and the weak resort to violence because they lack the power of the mind.